Object storage is essential in today’s connected world, with more applications generating media-rich files on a near-constant basis. Green House Data, a national provider of cloud hosting, colocation, and managed IT services, today released its latest improvement to the gBlock® cloud hosting platform with gScale Object Storage, enabling highly scalable, cost-effective storage for documents, media files, video, and other unstructured data. The new storage modes will also make it easier for users to move clouds between Green House Data and Amazon Web Services Swift-compatible storage environments. Object storage is distributed, meaning it treats all available hardware and disk drives, and treats files as containers, or buckets, rather than traditional storage, which is highly organized into directories. This allows better performance with less metadata attached to each file. “We named our object storage platform gScale because it is virtually infinite in its scalability. If you have petabytes of information that you need to access with some regularity, gScale is going to be the ideal cloud storage platform,” said Thompson. Object storage platforms also allow web interface access from anywhere with an internet connection, allowing convenient retrieval of files. gScale Object Storage is the third storage option attached to the gBlock Cloud, joining traditional file storage and block storage. The data center provider also offers four tiers of block storage so customers can maximize cost savings and performance depending on the application requirements. 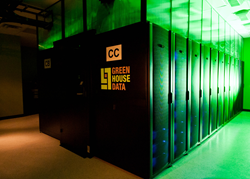 With data center facilities and cloud installations across the country, Green House Data is uniquely positioned to handle new, legacy, and location-based IT workloads, and offer disaster recovery services anywhere in North America. The company is a certified VMware provider, SSAE 16 Type II and HIPAA compliant, as well as a B-Corp and EPA Green Power Partner. Visit http://www.greenhousedata.com to learn more.